When I first started learning about wine, I drank out of plastic, orange juice glasses, fat thick rimmed such as Libby wine glasses. I would look at people in the industry and laugh and think wow really it’s just a glass. Boy was I ever very wrong, but hey when you start drinking wine when I did such as “Boones Farm” then moved up to “Ecco Domani” Pinot Grigio what do you expect. Through the many years and tasting after tasting in so many different stemware, it did not take long to emphasize what a difference these fine wine glasses make. Let’s discuss how to pronounce it correctly first. 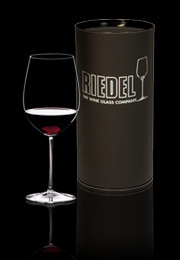 It is pronounced just like a needle but Riedel. Most people say Ry-del. Great, now we have it. Riedel has been making glasses for over 300 years into their eleventh generation of family owned and operated. It all starts in Austria, northern of Bohemia, bordering Schlesia and today the Czech Republic and Poland. About ten years ago I started doing wine tasting classes in wine shops that I managed. In my series about proper stemware, I would have short little fat wine glasses then I would have the proper series of Riedel. I would pour the identical wine in each glass so that each client could see the difference themselves. With so many skeptical people out there, it never shocked me to see 90% of my clients would purchase a collection of Riedel that same evening. They were sold and all it took was for them to see the difference. Sure there are so many other brands out there from Italy, Poland, etc…making fine wine stemware but after so many years in business, Riedel is a classic. It reminds me of Chanel #5 perfume, classic, stunning, beautiful and elegant. Most of all their collections are dishwasher safe other than their Sommeliers series, which must be hand washed. From the Vitis series to Tyrol, Vinum, Vinum Extreme, Overture, and the O. So many to choose from along with water, espresso, whiskey, desert wine, grappa, etc…. They have anything you are looking for including beer glasses. Some of their glasses are machine blown while other’s are machine blown lead crystal. Not only is each glass specifically designed for certain grape varietals, they are stunningly beautiful. Fine lead crystal that sparkles and is gorgeous to look at. Each bowl represents how each grape varietal will smell for the aroma and how it will hit your palate following sipping. How much wine should you pour into a glass? Typically no more than 4 oz. pours. You want to allow enough room to swirl easily without spilling and to lift the aromas. I have collected different series over the years and they are the ONLY wine glass I use at home. And when I go to a restaurant that has them on their table, I am impressed because that shows me they truly care about your wine experience. Having a perfect glass is not snobby or pretentious. Once you experience the aroma’s, the taste, you will understand the love affair with these remarkable fine glasses. Here we have the “O” series, stemless wine glasses, which goes against everything we were taught about touching the bowl and warming up the wine. They are fun, awesome conversation pieces. Everytime I pull them out people love them. 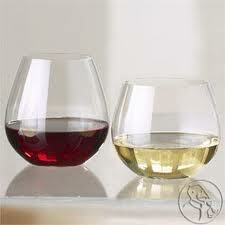 Although you can place these in the dishwasher, I have never ever washed any wine glass in dishwasher. When I had a gentleman from Riedel come and do a tasting in our store several years ago, he told me he only washed his glasses with vinegar, no detergent ever. A micro fiber towel works great, or just an other towel for polishing that will not leave lint. Steaming also works great for a sparkling impressive polished finish. Very Important: The biggest issue is not to ever stick your hand inside the glass as you are polishing. I once had an employee, cut his hand so bad, these are fine lead crystal and when they break, not only are they very sharp but also they break into a lot of tiny pieces. Truly remarkable fine stemware, elegant, beautiful and ever so magical. Well worth the investment. This entry was posted in Stemware/ Riedel and tagged fine lead crystal, proper wine glasses, quality, Riedel stemware. Bookmark the permalink. Yup, those glasses are sweet….of course, my firsthand experience with them comes courtesy of you…..lol. Not sure I’ve ever been to a restaurant that would serve wine in such glasses. I still need to do my glassware post! Thanks for reading. Capital Grill, Morton’s, and Fleming’s all use them and I believe Tryluck’s and Oceanaire, etc… more than you think but typically high end places. Mine will be arriving tomorrow. Can’t wait for those Vinum Extremes! Yay how exciting. You will love them! I bought a 30 piece set of the Sommeliers set for my birthday: Bordeaux Grabd Cru, Hermitage, Burgender Grand Cru, Riesling Grand Cru and the Jahrgangschampagner. I also have the Clos Erasmus Riedel Decanter. I agree, nothing less than great. Who knew a glass would make a significant difference in wine appreciation. These have now become my daily glassware. Thank you for reading and commenting on my post. Wow, 30 pieces, that’s great! I have collected many different varietals and styles for years and like you, they are my daily drinking wine stems. Enjoy them with your wine, they are magical! Your story was really inomvfatire, thanks!